Companies in the sands of Silicon Valley - Macromedia. I had taken this photo in 2002, while in the San Francisco Bay Area for a business trip to my employer, Oracle. On a weekend, when I had time and a camera in hand, I went for a short drive and took some photos. 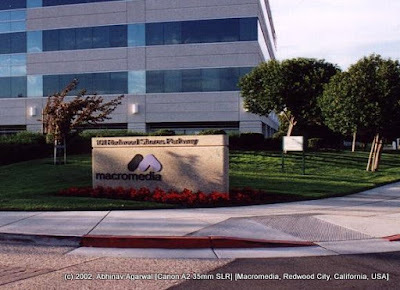 One such photo was of a company called Macromedia, which was the maker of the highly popular Flash and Dreamweaver line of products, among others. In 2005 it was acquired by Adobe, primarily for its Flash and Flex line of products and technology. Unknown to me, or perhaps forgotten, was the fact that Microsoft executive, Stephen Elop, now CEO of Nokia, had been the CEO of Macromedia at the time of its acquisition by Adobe (http://en.wikipedia.org/wiki/Macromedia). In 2002 Macromedia introduced Flash MX, which was to quickly become Flex, and became the catalyst for Adobe's acquisition of the company. One of the reasons cited by Adobe's CEO at the time was the fact that Macromedia had, in Flash, a runtime whose distribution required less than 2MB of space. This was a huge consideration then, especially with companies starting to think on how to distribute rich interactive experiences to users on phones. Adobe tried to take the Flash/Flex platform to the next level, of making it a computing platform with the introduction of Adobe Integrated Runtime (AIR), codenamed "Apollo", in 2007. This ambitious goal never quite fructified for Adobe, was exacerbated by the introduction of the Apple iPhone in 2007, the move of the web towards HTML5, Adobe's own inability to bring out a Flash runtime that could run performantly on smartphones, and finally saw Adobe donating Flex to the Apache Foundation in 2011 (http://www.techworld.com.au/article/407714/adobe_donates_flex_apache, http://blogs.apache.org/flex/) and moving its own efforts more towards development tools for building HTML5-based applications.